For the 1989 British play, see Greek Tragedy (play). Greek tragedy is a form of theatre from Ancient Greece and Asia Minor. It reached its most significant form in Athens in the 5th century BC, the works of which are sometimes called Attic tragedy. Greek tragedy is an extension of the ancient rites carried out in honor of Dionysus, and it heavily influenced the theatre of Ancient Rome and the Renaissance. Tragic plots were most often based upon myths from the oral traditions of archaic epics. In tragic theatre, however, these narratives were presented by actors. The most acclaimed Greek tragedians are Aeschylus, Sophocles and Euripides. The origin of the word tragedy has been a matter of discussion from ancient times. The primary source of knowledge on the question is the Poetics of Aristotle. Aristotle was able to gather first-hand documentation from theater performance in Attica, which is inaccessible to scholars today. His work is therefore invaluable for the study of ancient tragedy, even if his testimony is open to doubt on some points. The origin of Greek tragedy is one of the unsolved problems of classical scholarship. Ruth Scodel notes that, due to lack of evidence and doubtful reliability of sources, we know nearly nothing about tragedy's origin. Still, R.P. Winnington-Ingram points out that we can easily trace various influences from other genres. The stories that tragedy deals with stem from epic and lyric poetry, its meter — the iambic trimeter — owed much to the political rhetoric of Solon, and the choral songs' dialect, meter and vocabulary seem to originate in choral lyric. How these have come to be associated with one another remains a mystery however. Plutarch, in the Life of Cimon, recounts the first triumph of the young talented Sophocles against the famous and hitherto unchallenged Aeschylus. This competition ended in an unusual manner, without the usual draw for the referees, and caused the voluntary exile of Aeschylus to Sicily. Many innovations were introduced by Sophocles, and earned him at least twenty triumphs. He introduced a third actor, increased the number of chorus members to fifteen; he also introduced scenery and the use of scenes. ↑ Some discussion exists on the function of satyr plays, however. See: Griffith (2002). ↑ An exception is Prometheus Bound, in which Zeus strikes tyrannical attitudes. ↑ Paul Judges Emilio assumed that it was for this reason that the construction of the theatre needed a certain size to hold all the free citizens of Athens. See his History of Theatre in Italy p. 18. ↑ The Dionysia was also called Great Dionysia, to distinguish them from rural areas, plays a minor that took place in winter in countries around Athens. ↑ During the Peloponnesian War the number of comedies was reduced to three, to be performed once a day, at the end of the tetralogies. 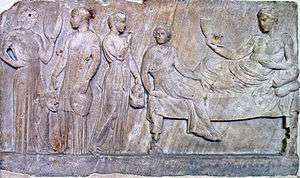 It has been argued, the Athenians took this decision due to their financial situation at the time. ↑ The presence of attacks on Zeus casts doubt onto the authorship of Aeschylus's Prometheus Bound. ↑ Some scholars equate the two sources, assuming an error of Aristophanes, of 17 instead of 7. Cf. Rossi & Nicolai (2006) 93. ↑ Winkler & Zeitlin (1992) 60. 1 2 3 4 Scodel (2011) 33. ↑ Easterling e.a. (1989) 1-6. 1 2 Aristotle, Poetics, 1449a. ↑ Suda "Arion" (α.3886 Adler); Joannes Diaconus Commentaria in Hermogenem ed. H. Rabe Rheinisches Museum 63 (1908) 150. 1 2 Harvey (1955); Easterling e.a. (1989) 4. ↑ Easterling (1989) 2; Sinisi & Innamorati (2003) 3. Cf. Horace Ars Poetica 275ff. ↑ Easterling e.a. (1989) 3, 5. ↑ Easterling e.a. (1989) 5f. ↑ For Aeschylus' innovation of Tragedy, see: Easterling (1989) 29–42. ↑ Plutarch Life of Cimon 8.7f. ↑ For Sophoclean theatrical inventions, see: Easterling (1989) 43-63; Sinisi & Innamorati (2003) 3. ↑ For the character of Euripidean Tragedy, see: Easterling (1989) 64-86. ↑ For a detailed study of the metric, see: Brunet (1997) 140–146. ↑ Aristotle Poetics 1449b 24-28. 1 2 For a discussion of different views on katharsis, see: Lear (1992). ↑ Oates & O'Neil (1938) xiv–xvii. ↑ Sinisi & Innamorati (2003) 3. 1 2 Gregory (2005) 8. ↑ Plutarch Life of Pericles 9.1. ↑ According to the Byzantine lexicon Suda, Aeschylus wrote ninety plays. See: Suda "Aeschylus" (αι.357 Adler). ↑ Rossi & Nicolai (2006) 27-28. ↑ Suda "Sophocles" (σ.815 Adler). ↑ Privitera & Pretagostini (2006) 276. ↑ Suda "Euripides" (ε.3695 Adler). ↑ Rossi & Nicolai (2006) 184.